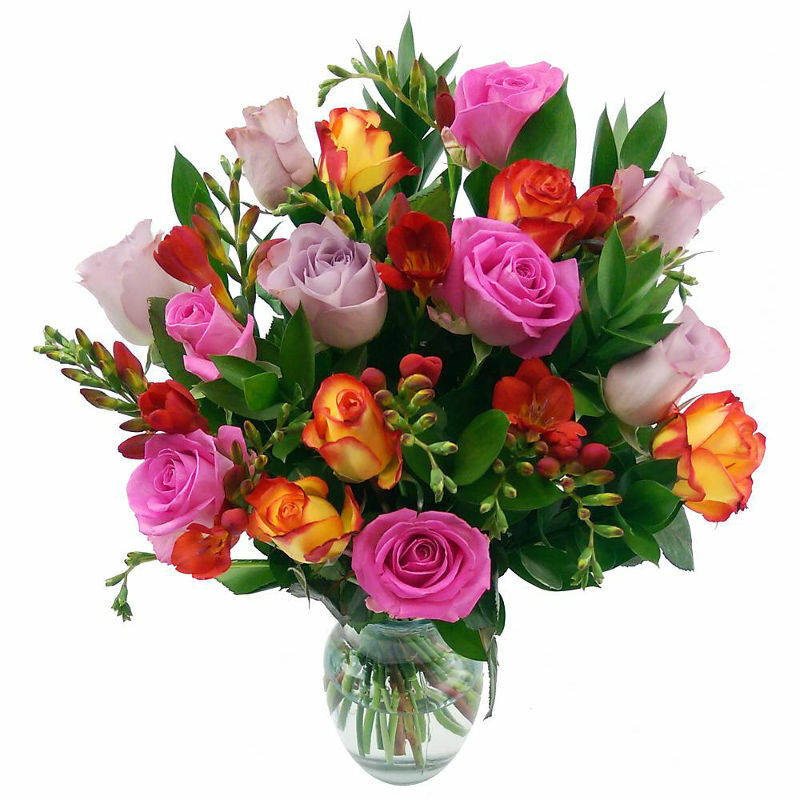 The Daydream Delight is an eye-catching and vivid floral arrangement designed with a mixture of pink, lilac and orange roses nicely complemented by pretty red freesia. Breathtaking as a gift, this marvellous arrangement is also perfect for treating yourself to a touch of colour and beauty for your own home. Colourful and captivating, the Daydream Delight is perfect for sending to loved ones on birthdays, anniversaries, as a gift to say thanks or as a way to say sorry. Whatever the reason for sending, this lovely arrangement is certain to put a smile on the face of anyone lucky enough to receive it. We offer free standard next day delivery on this bouquet for a price of just £34.99, ensuring you get phenomenally good value for money. Your fresh Daydream Delight bouquet can be delivered 7 days a week throughout the UK in our special delivery box to prevent damage while in transit, so it arrives in excellent condition when you need it to! For that extra special personal touch, why not add a Handwritten Greetings Card, a delicious box of Lily O'Briens Chocolates, a chic glass vase or an adorable teddy to accompany your beautiful fresh hand-tied Daydream Delight bouquet. Our large selection of arrangements containing sunflowers, germini and an array of different gift sets to suit every occasion.